A circle journal is basically a book or any medium that can be sent back and forth, or around between friends - each person adding a new page etc before sending it on to the next. You might have a group of girlfriends who each begin their own journal (gathering/decorating the actual book) and have a schedule to pass it around, so that each friend contributes and it eventually ends back in the original owners mailbox, full of pages from each different person. Or, you and one friend might each start a journal and send them back and forth until they are full, or just have one book going between you indefinitely! Currently, I have 2 different journals going back and forth with 2 different friends. It’s such a cool way to stay in touch and a great excuse for an easy little creative outlet. The first journal is housed in a little tin that my friend created, and left part of the cover blank for me to contribute to. Inside the tin are giant playing cards that we use to alter/decorate. Our theme? ‘Random madness’ = anything goes! It’s so much fun to get that tin in the mail, open it up - look through the pile of cards we have already made and then discover a new one sitting at the bottom! We use pictures of ourselves, inside jokes, share stories, feelings...it’s a fun way to connect and keep our friendship fun even though we live on opposite sides of the world. Another friend and I are using the more traditional book style for our journal. I created the cover from 2 pieces of sturdy chipboard, and added some different sized pages to the inside. We can use anything to create our pages - envelopes, file folders, junk mail etc, and simply punch holes and add into the journal rings. The theme for our journal is ‘motherhood’, we love to share inspiration and frustration, give/receive advice and celebrate our scared duty of mama together! I’m sure we will copy the book at the end so we each have our own, and cherish for years to come as our children grow and we look back on what our days were like during this time. Because we are both busy mamas, I included in the binding at the back of the book several sheets of stickers, labels and a bag of ‘goodies’, so that the pages could be created while laying on the grass at the park or other fun place with the kids in tow! If you have family or friends who live in faraway places, this would also be such a fun project for your children to do with their friends. For us, a phone call or an email is no big deal at all - but for little people their friends can seem SO far away! Make a simple book with cardstock and let them draw/decorate/write on a page and send it to their friend to do the same, what fun the mail will be now! We’re looking for a few Mamas to participate in the TodaysMama “Day In The Life” circle journal with Emily Falconbridge. If you’re interested in participating, send an email to info@todaysmama.com with “Journal” in the subject line. Include your full name, mailing address, phone number and reason for participating. 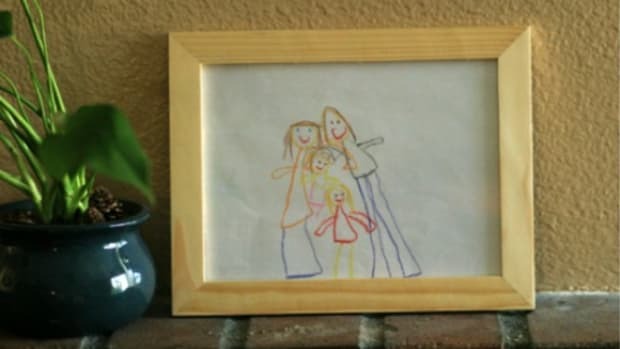 We’ll keep the circle journal going for six months – the last person will send it back to Emily Falconbridge and a recap article, complete with photos, will appear on TodaysMama.com next March. Participants will cover the cost of journaling supplies and shipping. You’ll have a quick turnaround time – the journal will be in your possession for only 7-10 days.